March has been a busy HTM month for me with lots of travelling and experiencing HTM in different countries with different styles, has made me think about the sport and its future. Where are we going? What is it we want? All HTM/Freestyle judges need to put some thought into those questions as the responsibility for the sport and which way it is developing very much lays with them. Human beings - HTM handlers included - use what works and what achieves success – we do what we gain something from. If something is rewarded with top placings, then we will do more of it. The sport will move in whichever direction the judges' marks decide. One of the new things that came out this year and which I think surprised many of us, was the banned moves at Crufts*. Crufts is important – and a change of rules for Crufts could easily become a rule change for all British competitions. I worry that a change could have consequences that goes far beyond the British borders. England is the country of origin of this sport and British top handlers are amongst the best in the world. They have been role models and an inspiration to newcomers around the world. I would hate to see them getting left behind because they are so restricted as to what they can do whilst competitors from other countries are free to innovate and be creative. In the future it could be very hard for overseas dog and handler teams to compete in Great Britain as routines would no longer fit in with the UK rules. I fear that such a drastic change of rules in one country could create distance between British HTM and HTM in the rest of the world and that would be very sad. We need each other for this sport to develop and grow. This sport is now a world sport - not just a British sport. I do fear that banning moves will stop many handlers’ creativity. When the new Crufts Rules were published, I started to worry about my own routine. One of my new moves was my dog doing the 'canine elephant' with front paws on my upturned foot. He used my foot to support his front legs to keep his balance. Was he balancing on my upturned foot? If so, then it would be a banned move. I nearly took a safe, interesting, new move out of my Crufts routine, because I was afraid. That's not a good development. Another worry for me is that if you have a list of banned moves, then it is unfair to down mark/disqualify/eliminate for moves that are not on the list, even if you as a judge consider them dangerous/unsafe. If some moves are forbidden, it easily makes all other moves acceptable. It removes responsibility away from the judges, which in my opinion is not good for the sport or for the judges. To take a judging appointment serious, you need to feel responsible. New moves develop all of the time. A list would constantly need to be updated especially as the moves on the list are very specific. For example the new rules now state that a dog is not allowed to be held/supported above handler’s shoulders whilst the handler is standing. So what if the handler is sitting on the top step of a ladder with the dog standing on his shoulder? 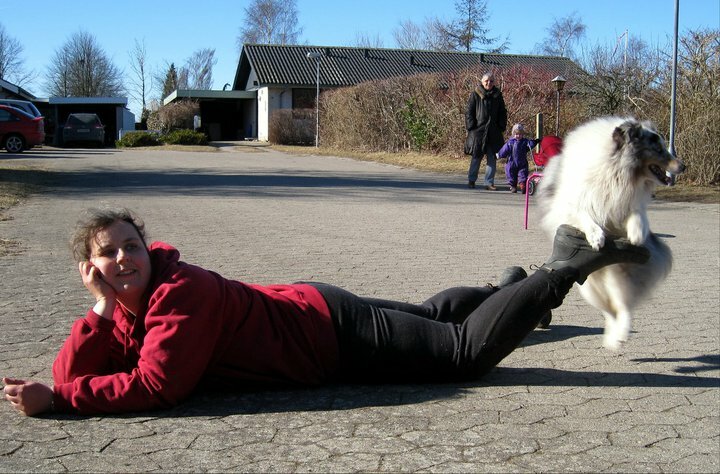 It is not forbidden as the handler is sitting, but the dog would be held much higher than if the handler was standing. It would be very hard to make a list that took all risks and possible variations of moves into consideration. As I said – I do not believe in banned moves, but I do believe in educating the judges so that they learn to see which moves are dangerous to the dog or the handler and become confident enough to mark those moves down or eliminate if necessary. HTM is a very complex sport to judge. It already takes thorough education to be good at it, so let us include knowledge about anatomy and physiology in the syllabus, so that we know enough to judge fairly which moves are unacceptable and which are not. Judging should never be based on personal preferences, so we need knowledge. I would like to educate rather than ban. Also take the handler's/trainer's skills into consideration. If a move has been taught in a careful and safe way so that the dog can perform it with confidence, then why punish that team for other handler's unsafe training? If a handler has managed to teach a dog to balance safely on his or her upturned feet then that is good. Don't punish that team in an attempt to stop other teams from doing it less safely. Mark down or eliminate if a move is performed in an unsafe way. If handlers realize that they will be marked down heavily if they perform a move that the dog is not quite ready to perform safely, then they will train more before they test a move in the ring. Things can always go wrong. When you live life, you risk getting hurt. We don't take the ‘A’ frame or the dog walk out of agility just because the dog can fall off it. Give the handlers in our sport some credit too and trust that they don't want to see their friend and dancing-partner hurt. Let us keep the free in freestyle and teach our judges to handle that. My wish is that we educate rather than limit the creativity and freedom of our sport. It seems to me that the latest trend in our sport is that we have to come up with the most complicated, difficult, impossible to teach move – the harder the better. As soon as one handler comes up with a difficult move, someone else will try to top it. Difficulty and technicality is fine, if it is not at the expense of flow and musical interpretation. I have sometimes felt that the very technical moves were rewarded whether they made sense in the routine or not. Sometimes it has felt as if the winning routine was choreographed to show how many difficult moves the dog could do in 4 minutes rather than to demonstrate flow, teamwork and musical interpretation. Unfortunately if something is rewarded, we will see more of it. I fear that HTM can become a sport that has less to do with music and more to do with technical difficulty. Such a development would make me very sad. The magic does not come from technicality – it comes when the dog's and the handler's movements become one with the music. HTM is a unique dog sport because it can make you feel – it can make you laugh, cry, hold your breath... but it only happens when it becomes magical because the music and the performing team are one. An instructor at a choreography day I once attended, told me a story, that has inspired me ever since. She said that choreographing an HTM routine is like baking a cake. The cake does not become any better just because you put everything you have in your kitchen in it. Curry is a very strong spice on its own, but as powerful as it is, it would not make a banana cake taste better. It is the same with a HTM or Freestyle routine. Even the most powerful move in the world will not make a routine better, if it does not make sense according to the music. The inspiration of the moves and the choreography should come from the music – not the other way around. And all moves should punctuate the phrasing and changes in the music. 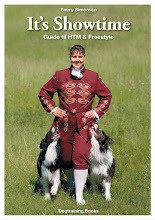 My fellow judges and handlers – please let us make HTM Curry free territory! *)The following moves are NOT permitted during any routine. If any of the following moves are used the dog and handler will be eliminated from the competition: dog doing head stand (also known as tripod); dog being held/supported above handlers shoulders whilst handler is standing; dog performing a forward or backward roll; dog balancing on handlers upturned feet and; doing performing a handstand or walking on front legs only." Crufts, torsdag (første dag på Crufts).